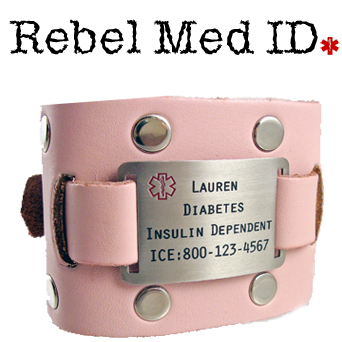 Let your spirit for your own individuality soar with our New "Rebel Med ID" Series Medical bands ~ Our Girls & Ladies leather band in Pink. Genuine leather band made in the USA, with buckle closure, This Pink band is has 12 metal studs and comes with a stainless steel medical tag that easily snaps in. Medical information engraved on the front. There are no further discounts on this product. *Note: Leather is a natural material and is therefore signs of wear are normal. Irregularities in the consistency and depth of the color in each band should not be considered a defect but inherent of the natural beauty of leather. 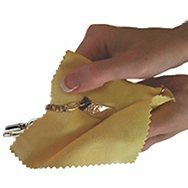 Fits wrist/arm sizes: 6-1/4 to 7-1/2" Measure carefully! If wrist/arm size is not listed on drop down menu below it will not fit! Sizing: Wrap a soft tape measure or ribbon around the wrist/ arm where you will wear your bracelet to get the correct measurement. Please measure carefully- we cannot resize this item! Please note - the more lines used, the smaller the engraving will be. Engraving is done in CAPITAL letters, please spaces between words for clarity!